Full length protein aa 118-269. Full length mature protein minus the propeptide from aa 1-117. Our Abpromise guarantee covers the use of ab9722 in the following tested applications. WB Use at an assay dependent dilution. To detect mIL-1b by Western Blot analysis this antibody can be used at a concentration of 0.1 - 0.2 µg/ml. Used in conjunction with compatible secondary reagents the detection limit for recombinant mIL-1b is 1.5 - 3.0 ng/lane, under either reducing or non-reducing conditions. ELISA Use at an assay dependent dilution. To detect mIL-1b by direct ELISA (using 100µl/well antibody solution) a concentration of at least 0.5µg/ml of this antibody is required. 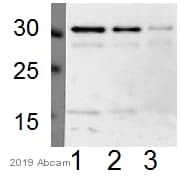 This antigen affinity purified antibody, in conjunction with compatible secondary reagents, allows the detection of 0.2 - 0.4 ng/well of recombinant mIL-1b. Neutralising Use at an assay dependent dilution. To yield one-half maximal inhibition [ND50] of the biological activity of mIL-1b (50 pg/ml), a concentration of 100 - 150 ng/ml of this antibody is required. IHC-Fr Use at an assay dependent dilution. PubMed: 18420712Acetone fixed. Immunocytochemistry/ Immunofluorescence - Anti-IL-1 beta antibody (ab9722)Image courtesy of James Harris by Abreview. ab9722 staining IL-1 beta in murine bone marrow-derived macrophages by Immunocytochemistry/ Immunofluorescence. Cells are immortalised murine bone marrow-derived macrophages stably transfected with GFP-LC3 (green) to visualise autophagosomes. The cells were fixed in paraformaldehyde, permeabilised in 0.01% Triton X-100 and then blocked using 5% serum for 1 hour at 20°C. Samples were then incubated with primary antibody at 1/200 for 1 hour at 20°C. 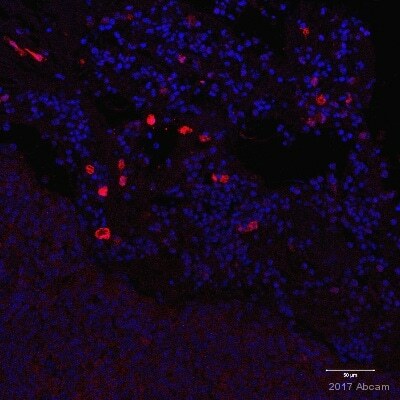 The secondary antibody used was a goat anti-rabbit IgG conjugated to Alexa Fluor® 568 (red) used undiluted. ab9722 staining IL-1 beta in rat brain tissue sections by Immunohistochemistry (PFA perfusion fixed frozen sections). Tissue was fixed with paraformaldehyde and blocked with 10% serum for 1 hour at 25°C. Samples were incubated with primary antibody (1/100 in diluent) for 10 hours at 25°C. 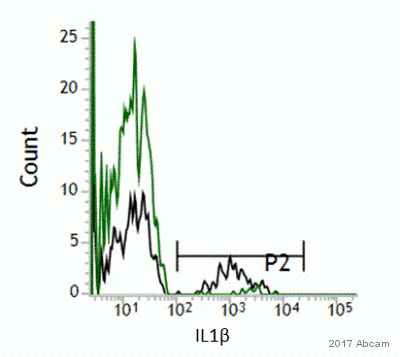 An AlexaFluor®555-conjugated donkey anti-goat IgG polyclonal (1/300) was used as the secondary antibody. ab9722 staining IL-1 beta (green) in murine macrophage cells by Immunocytochemistry/ Immunofluorescence. Cells were fixed with formaldehyde, permeabilized with 0.1% Triton X-100 + 3% BSA and blocked with 3% BSA for 3 hours at 25°C. Samples were incubated with primary antibody (1/100 in 1% BSA in PBS) for 1 hour at 25°C. A FITC-conjugated goat anti-rabbit polyclonal IgG (1/100) was used as the secondary antibody. Nuclei were stained with DAPI (blue). 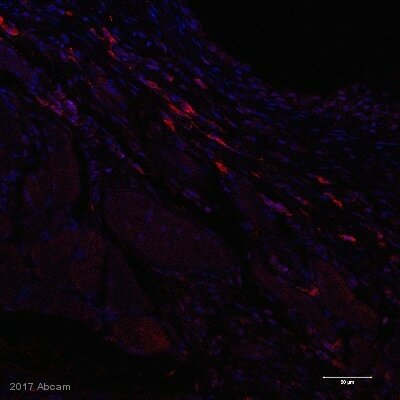 IHC image of IL-1 beta staining in mouse kidney formalin fixed paraffin embedded tissue section, performed on a Leica BondTM system using the standard protocol B. The section was pre-treated using heat mediated antigen retrieval with sodium citrate buffer (pH6, epitope retrieval solution 1) for 20 mins. The section was then incubated with ab9722, 1µg/ml, for 15 mins at room temperature. A goat anti-rabbit biotinylated secondary antibody was used to detect the primary, and visualized using an HRP conjugated ABC system. DAB was used as the chromogen. The section was then counterstained with haematoxylin and mounted with DPX. 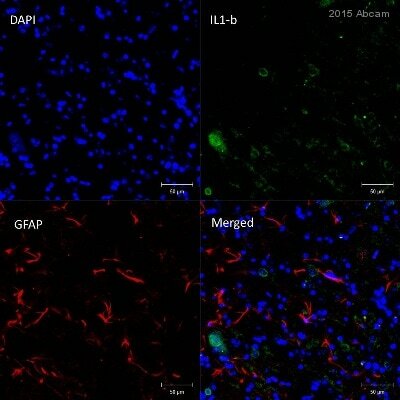 Immunohistochemical analysis of PFA perfusion fixed frozen mouse brain, staining IL-1 beta (green) with ab9722 at 0.5 &microg/ml. 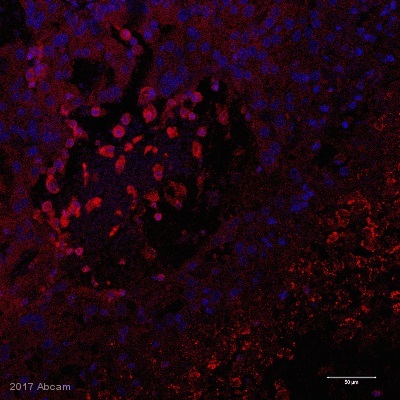 A peroxidase conjugated secondary antibody was used and staining was detected using a fluorescein Tyramide Signal Amplification (TSA™) reagent. Sandwich ELISA detecting IL-1 beta using ab9722 at a concentration of 0.1 µg/ml. Publishing research using ab9722? Please let us know so that we can cite the reference in this datasheet.